On Saturday, wrestling prodigy Aaron Pico will make his MMA debut on the main card of Bellator 180/NYC. For the uninitiated, Pico made news in 2014 when he left high school wrestling and forfeited any potential collegiate wrestling career to sign with Zinkin Entertainment. He continued to compete in freestyle wrestling for a shot at the Olympics, but MMA was always the ultimate goal. This past summer he ended up one match short of winning the U.S. Olympic Trials and has since focused on his MMA debut. In his debut, the 20-year-old fighter will face Zach Freeman. “The Altar Boy” holds an 8-2 professional record and has been ranked as high as #118 LW in the Fight Matrix system. It is safe to say that Pico will face one of the toughest debut opponents for a wrestling prospect in the last 10 years. 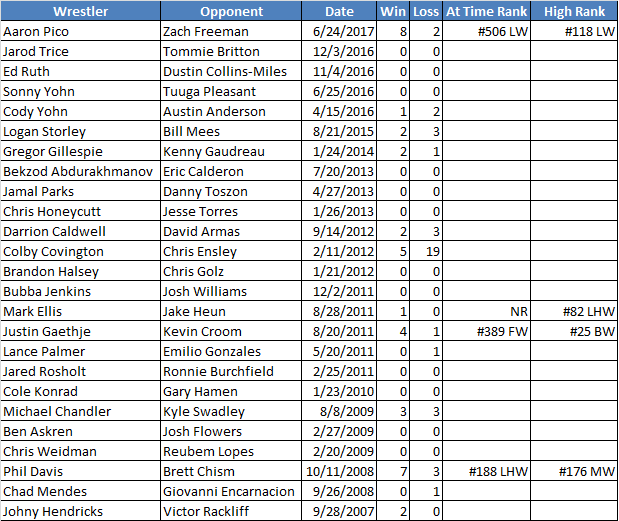 The following table shows the debut opponents for all NCAA Division I wrestling All-Americans in the last 10 years who have transitioned into MMA. As you can see, only three others besides Pico have faced fighters who were ever ranked and only two others faced opponents who were ranked at the time. Freeman also has more wins that any of the other opponents, slightly beating out Phil Davis’ debut opponent Brett Chism.